I am a Barefoot and Minimalist runner currently living in Vancouver. I was born in the UK, but I have been lucky enough to live in the UK, Canada and Australia. I trained as a high-school teacher in the UK, specialising in Economics, Business and Information Technology. However, I have spent most of my working life in Telecoms Engineering and Operations. Since 2005 I have been a "Stay at Home Mum" to a wonderful Son. Since he was born we have travelled and lived in various countries. He is one of the few children who can happily say they have lived with Bears; both Grizzly and Koala. He was diagnosed with PDD-NOS; a form of Autism, in 2010 and since then I have been active in trying to understand his condition as well as trying to enable him to live happily within it. I started running in the Autumn of 2009, after a car accident in Australia highlighted potential "early on-set Osteoporosis". After 4 months of light running, I developed serious stress fractures in my ankle and heel. I was told by various Doctors to give up running, but true to my perverse streak, I began Barefoot Running. Within 6 months I had gone on to run my first half marathon. Within the next 12 months I went on to run five half marathons; two of which we trail. I have been active in the Barefoot Running community since May 2009. Initially within the Runners' World On-line forums and then within the Barefoot Runners Society. I have worked with various journalists to create articles about Barefoot Running. I have written pieces for Barefoot Runners Society, "The Barefoot Running University" as well as Active.com. In December 2011, I took a blog writing position with Canadian Running Magazine. I write a weekly post for them about topics of interest in the barefoot and minimalist running community, as well as sharing some of my adventures. After a re-post of one of my articles by Christopher McDougall, I founded "The Run Smiley Collective". This was a place where writers (mainly from the Barefoot and Minimalist community) could post about "running and being happy". In the seven months since its conception in May 2011, "The Collective" has over thirty writers contributing. It has also over 60 followers, 17,000 page views and over a 190 articles. I was lucky to be invited by Merrell to the NYC Barefoot run in September 2011, where I participated in a roundtable discussion about the current and future state of Barefoot running. 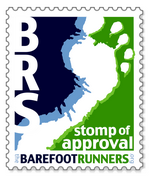 In Late 2011, I have taken a role on the Executive Committee of the Barefoot Runners Society as the Regional VP. I now help to manage the day-to-day running of BRS. I am also the Chapter President of the Barefoot Runners Society - Canada-Vancouver chapter. Thanks for trying to educate the public and provide the truth when it comes to barefoot running or locomotion. You have had a troubled life story and now you live in a place of pure nature. Maybe we have something that meets your interest. Now, there is something in between fully barefoot and the so-called minimalists shoes. Minimalists actually do not satisfy most expectations regarding pure barefoot feeling (wet, dry, hot, cold, air, water, dirt, soil, etc.) But there is something new now - that never gets old! Being barefoot on natural soil with all its sensation and stimulation, but still without taking the risk to get hurt. Have a look at the PaleoBarefoots®.